You've been asking for it! So here it is! Our fall lineup... I hope you all can find a program that interests you! And a reminder to mark your calendar for Peinhardt Farm Day on Saturday, October 24 from 9-3. All programs at Agriplex Heritage Center, 1714 Talley Ho St, Cullman. Call 256-297-1044 or e-mail cullmanag@gmail.com to register. September 5, 9:00-10:30am- Seed Safari, Farm Kid’s Club: This hands-on program for kids ages 5 and up with an adult will explore the diverse world of seeds- from tiny mustard seeds to large coconuts. We will taste, craft, play, and learn. $5 per child, $10 max per family. Registration required. September 8, 6:00pm- Book Club Info Meeting: Interested in a monthly book club focusing on science, gardening, and nutrition? Come join the fun! Free. 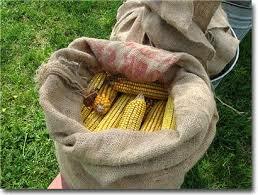 September 17, 9:00-11:00am- Shocking, Shucking, and Shelling CORN, Heritage Homeschool; We will dive into the world of corn- its history and our current dependence on this crop. We will make shocks to dry the corn, use shucks to make corn shuck dolls, and shell corn. And of course we will end with popcorn! For all ages with an adult. $8 per child, $16 max per family. Pre-Registration required. September 17, 6pm- Specialty and Tree Fruit for the Home Landscape- Specialty fruit class for beginning gardeners or small scale farmers. Fruits to be covered will include figs, Asian persimmons, Oriental pears, Mayhaws, Feijoas, Paw Paws and a few others. Taught by Extension Agent Tony Glover. Free program! October 1, 6:00pm, Heritage Skills- Locker Hooking. Create a coaster using scraps of material and rug mesh. You will also learn to make rugs out of plastic grocery bags. Taught by Judy Tyler. Limited to first 20 registered. $10. October 3, 9:00-10:30am- Forestry- Farm Kid’s Club: This hands-on program for kids ages 5 and up with an adult will explore our local trees and their historic and present uses. We will taste, craft, play, and learn. $5 per child, $10 max per family. Registration required. October 15, 9:00-11:00am- Alabama History in Plants, Heritage Homeschool; We will tell stories of Alabama’s native people and early settlers through plants- peanuts, sweet potatoes, cotton, squash, and more. For all ages with an adult. $8 per child, $16 max per family. Pre-Registration required. October 20, 6:00pm- Book Club Discussion- Free. For book assignment and more info, contact Rachel Wiser at 256-297-1044. October 24, 9:00-3:00, Peinhardt Living History Farm Day at Peinhardt Living History Farm. www.peinhardtfarm.org. November 3, 6:00pm- Heritage Skills- Three Legged Stool; Use firewood to create a useful stool to have around your home. Taught by Bill Peinhardt. $5 per person. Pre- Registration required. November 7, 9:00-10:30am- Turkey Talk- Farm Kid’s Club: Meet the star of Thanksgiving and learn about this historic bird. $5 per child, $10 max per family. Registration required. November 19, 9:00-11:00am- Now We Are Cooking!, Heritage Homeschool; Learn basic cooking skills and healthy recipes to take home. For ages 8 and up with an adult. $8 per child, $16 max per family. Pre-Registration required. December 5, 9:00-10:30am- Santa’s Workshop- Farm Kid’s Club: Create holiday decorations and nature crafts to take home or use as gifts. $5 per child, $10 max per family. Registration required. December 5, 2pm- Grapevine Wreath Making- Celebrate the holidays by making your own reusable grapevine wreath and decorate it with nature’s evergreens to hang on your door. $5 per person; limited space- must pre-register. December 8, 6:00pm- Heritage Skills- Craft Night- Rotate through one of our craft projects, or bring your own to work on and enjoy fellowship with other crafters. Free. December 10, 9:00-11:00am- Animal Tracks and Signs, Heritage Homeschool; We rarely see wild animals in nature, but that does not mean they are not there. We will learn signs of animals in nature and which animals made them. We will make a track guide to take home. For all ages with an adult. $8 per child, $16 max per family. Pre-Registration required. Old Timey Crepe Paper Flowers for Decoration And much more!